Democratic Gov. Maggie Hassan urged the Senate on Tuesday to reverse course and expand Medicaid to an estimated 58,000 poor New Hampshire adults. CONCORD, N.H. (AP) — Democratic Gov. 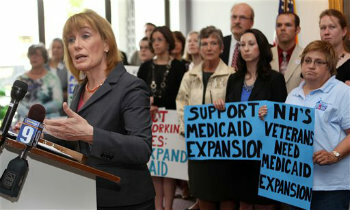 Maggie Hassan urged the Senate on Tuesday to reverse course and expand Medicaid to an estimated 58,000 poor New Hampshire adults.